Pinewood Derby 2007 | got marko? 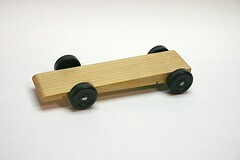 The pack’s 2007 Pinewood Derby was held the first Saturday in February this year. Only #2 was competing this year as #1 had moved onto Boy Scouts. At left is #2’s car “The Natural.” He wanted a thin wedge car again this year, so I cut the block to the shape he wanted. Once he was done sanding the saw marks off, he liked the grain pattern so just went with a clear coat. Much work was done on the axles and wheels to get them just so. At the practice day, the car was running straight, but a little slow, so we added more graphite and #2 spun the wheels on our wheel polishing setup. The day of the race came and The Natural seemed to be running well. He won most of the heats he was in (though the scoring is on time alone) and ended up finishing third overall in the pack. 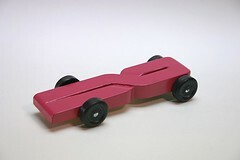 This means another trip to the district pinewood derby (he’s qualified every year in scouts for the district race). I built three cars for the open class races, two for the stock class and one for the unlimited class. This was my open stock car, it finished fifth overall. 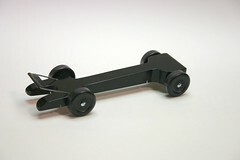 I probably should have spent more time on the axles instead of the design. The wife is a den leader this year, so I built this car for her to race. 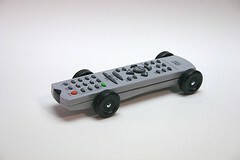 For the open unlimited class I stuffed this old DVD remote with lead and slapped on the wheels. It finished second to a slightly heavier car.